France's President Emmanuel Macron has formally accepted his high-profile interior minister's resignation a day after he said he wanted to keep him in the government, in the latest blow to his administration. The French presidency said Macron asked Prime Minister Edouard Philippe to be temporarily in charge of the interior ministry until Collomb's successor is appointed. A weekly Cabinet meeting is scheduled on Wednesday. Earlier Tuesday, an official at the French presidency said Macron regrets Collomb's decision and considers him to be a friend. He spoke anonymously in line with the presidency's customary practice. On Monday, Macron's office said the leader rejected Collomb's resignation. Yet Collomb insisted on Tuesday: "Today, given rumors and pressures there might be, I don't want the fact that I'm a candidate somewhere to trouble the interior ministry," he said. 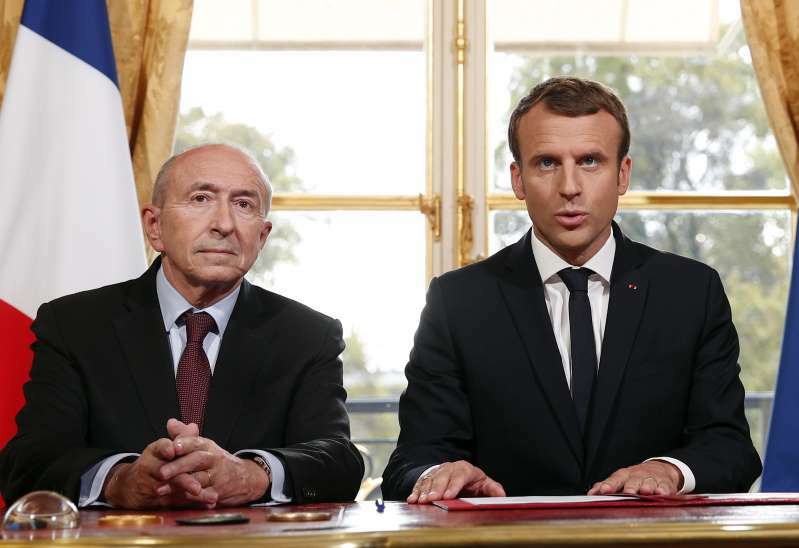 Earlier this month, Collomb expressed his intention to stand down so he could run as mayor of the city of Lyon in spring 2020. He initially said that he would resign next year to start campaigning. The announcement prompted criticism from opposition leaders from the right and the left, saying the interior minister should be focused on his job rather than getting ready to campaign for another position. An experienced politician as mayor of Lyon for 16 years, Collomb became Macron's key ally when he left the Socialist Party to join his centrist, pro-European presidential bid. He was holding one of the most senior positions in the Cabinet, supervising the fight against extremism on French territory. The news comes as Macron reached record low in polls since his election in May 2017. Last month, popular environment minister Nicolas Hulot, a former TV personality, unexpectedly announced his resignation, pointing at the government's slow pace of progress on green issues. Macron was recently criticized by political rivals as being arrogant and out of touch with the people when he told a young unemployed gardener this month he could find a job in a restaurant just by "crossing the street." He also struggled for weeks amid a major scandal over his former security aide that erupted in July when the man was identified in a video as acting violently toward a protester while wearing police equipment.